When browsing book titles recently, I came across several related to engaging the culture, participating with the culture and generally having to deal with the culture that Hollywood has created for America (and the world, really). The titles just ran at me and I couldn't narrow down which one to read so I read all four. I reviewed two at 5 Minutes for Books and these are the other two. Each book was uniquely different and unique and thought provoking. However, none of them changed my opinion at all. 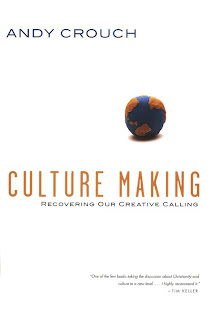 Culture Making : Recovering Our Creative Calling was the last of the four books that I read, but it should have been the first. When you decide it's time to pull this book out and read it, you should pull your thinking cap out with it. It is not for the faint of heart, nor is it impossible to digest. It just takes time and careful thought. Andy Crouch isn't writing "just about Hollywood" but explores the topic of culture and expands it to mean the culture within our own homes, in our spheres of influence. Think detailed - like the culture of a dinner table when the food is home grown. He argues that a culture cannot be changed unless something better is offered to change it with. For example, your family might have a culture where you watch a movie and eat pizza together every Friday night. You aren't likely to change that culture (aka tradition) unless something better is offered. Perhaps you don't find fellowshipping over the television to be ideal, but until you have something more practical offered to you that you like better, you aren't likely to ditch the habit as it is something that your family enjoys doing together. To condense this argument for purposes of Hollywood movies, we aren't likely to stop going to see movies, however sub par or just plain BAD they might be. We will likely keep attending and supporting what we're given and we won't make a choice to do otherwise unless something better is presented. Crouch argues throughout the first half of this book that it is human nature to keep doin' what you're doin' unless you are presented with a better option. The second half of this book address the issue of the Gospel as it relates to culture. This book really was fantastic and lays the ground work for a discussion on culture - what it is and how we approach it. I highly recommend this one and I'm not saying that lightly. I really do highly recommend it. (I can say that a third time if you wish.) It will make you think and it prepares you well to be a thinking and discerning culture-maker. 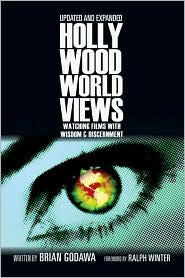 Hollywood Worldviews : Watching Films With Wisdom and Discernment is an appreciated addition to the Hollywood culture discussion. The cover art I have here is from the second edition of this book. I would recommend the second edition merely because it has been updated with recent movie releases and is therefore more current. This book is not a "watch anything and everything you want" book. Not at all. Neither is it a "avoid anything and everything to your soul's health" kind of book. Instead it is a hard hitting book that explains to you that each movie has a world view and author Brian Godawa takes a look at the various world views that various films espouse. He talks about and gives lists to accompany: movies that explore romanticism, movies that reconstruct traditional gender roles, movies that define postmodernism, movies that employ the Christ myth, etc., etc. ". . . I want to make a significant qualification to everything that has been written. When Christians learn about discerning worldviews in movies, there is a tendency to see movies only as a means to an end. An informed Christian will analyze a movie in order to "understand our culture" and share the gospel with that culture. In this sense, they only "use" movies without listening to them. They will reduce a movie to its ideas and entirely bypass experiential truths that it may communicate. Please consider this important caveat: I am not saying that moviegoing is a "figure out the worldview" game, as if that is all there is to it. Godawa's mission is to make you think about the movie that you are watching, and not just experiencing it. At the same time, we can't NOT experience a movie. Our emotions will be swayed by the people we meet and the situations and scenarios that we find them in. Hence we feel knots in our stomachs when Darcy is maligned by Mr. Wickham and why we are crying happy tears when Elizabeth and Darcy end up together in the end. We feel because we're human. We should also think because we are created beings with purpose and design and we need to realize that in order to live that truth. I think the bottom line argument that I agree with from all four of these books I have read is that movies cannot be "mere" entertainment. We should be taking steps to think about and understand the various worldviews and arguments that each movie presents. We should be listening and discerning truth from untruth and applying it correctly to our lives. Are movies bad? No, I don't think so. Are movies good? Not all the time. I don't believe that we should accept everything that Hollywood gives us point blank, assuming that it has "some good qualities and some bad qualities" and that they might balance each other out. For that matter, I do not believe all BOOKS are good and worthy of being read. Some books are written poorly, and couldn't seem to tell right from wrong if either ran up and bit them. Always, I think we need to be careful about what we "put inside of ourselves" for digestion knowing that what goes in will come out. I do think that there is room for Christian liberty when it comes to movie watching. (I know. Benevolent of me, don'tcha think?) What one person can tolerate, another cannot for a variety of reasons. Just because I will not watch something, doesn't mean than my Christian brother/sister ought not to either. (I'm repeating that again to myself internally.) That is why I appreciate these books because they argue discernment for me! We must test. We must think. We must discern truth and apply it accurately. If that can be done, then movies can be enjoyed. If we only watch movies for entertainment purposes, then we've lost something very important and perhaps ought not to be watching them at all. Movies are mostly dangerous when we refuse to think about them. Therefore I am glad to have had the opportunity to read these four books and think they are worthy reads. Read my "sister" review: Engaging the Culture at 5 Minutes for Books. Fascinating reviews. These topics have been on my mind quite a bit over the past year especially since I have been reading more. I approach tv and movies with the question "Could I be doing something better with my time?" which usually pertains to the quality of the entertainment. I have always been critical when it comes to what my kids take in when it comes to entertainment but have only started asking those same questions of myself. One positive result has been reading more and watching less. I think discernment is the key word...really thinking about what one takes in and not being partaking passively. Just stopping by to say thank you for your sweet comment on my blog. As I have been so hit-and-miss on my blogging recently, I'd be curious how in the world you found me...especially at 2 in the morning! LOL Have a blessed day! I agree that each person's sensitivities as far as worldly culture lies in different places. I know what I can take and I know what is a sensitive trigger for me, and should choose to avoid. Crouch's book is now on my list! Crouch's book was definitely one of my favorite of the this year. It has to be the best book on the topic. I'm already looking forward to a re-read.